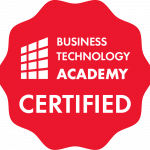 Be a Pioneer – Technology Backbone training programme for Business Technology Leaders is a 4-module training programme that gives you the skills and tools to manage business technology for the benefit of the business. Technology Backbone training programme is intended for IT and business decision-makers who want to get a holistic picture of how IT should be managed in order to provide maximum value for the business. The training programme consists of four modules: Strategy and Governance, Sourcing and Optimisation, Development and Services. The programme structure consists of 6 on-site training days and 2 to 3 days of (independent) pre-study. This training will be conducted in Finnish, please contact us if you need training in English. Strategy work and management concept in practice. Presenting the plan to the business and BT management of the case study company. Service Automation – Where self-service and automation can be used and how it affects Service Manager’s work? Service attitude as a competitive factor – how to become a trusted business partner? Creating business from services – A case study of an example company. Price of the entire training programme is 6900€ + VAT/pp incl. all materials & certificate of participation. The participant may take part in one or all the modules of the longer training programme. Contact us to customize your participation. Any changes are possible two weeks prior to the starting date of the first training module of the programme. The Academy reserves the right to charge the full price of the training for any cancellations made later than this. Prior to the start of the first training module, it is possible to transfer your seat to another participant for no extra charge. In case of illness, the participant may take the missed module during the next training programme organised. The length and content of our training programmes can be tailored to fit your organisation’s specific needs. The academy offers a framework and a check list to follow when building a new organisation for example. This has enabled me to move forward in my own career as well. The training was extremely helpful since the beginning and I still regularly find myself going back to some of the course material. I'm now able to create more valuable services and concepts to customers since I have more insight on how my designs can best support their organisational targets. Hard and soft skills in one package! My experiences in business and sales management, as tough as they sometimes have been, can also be seen in my training methods: I’m able to really challenge the students and raise the bar high enough! After coaching hundreds of companies, I know every situation really is different. All the new aspects that come up during training are also excellent chances for me to develop myself as a coach and as a facilitator. My passion towards goal-oriented development comes from my past in national-level team sports. Nowadays that type of training has been replaced with more recreational style of exercise and enjoying the silence when surrounded by nature. My motto is “Development ends in satisfaction”. Most of my job assignments have revolved around different aspects of project work. For the past 20 years, I’ve been a part of big IT-organisations and gained a lot of experience in developing project management within various organisations, as well as coaching project managers and steering group members. I believe that the best thing every project professional can do to their career is to go through a not so successful but educational project. Sharing those experiences, with the success stories, can be one of the most effective ways of coaching. I’m also making sure the participants understand the value of using their common sense at work. Theory builds a solid foundation, but the best project managers are those who know how to apply that knowledge through either learning from their own or other’s mistakes. My passion towards project work reflects in my free time as well. I bought a summer house a couple of years ago, that has required all sorts of fixing up. Project management skills were very helpful when scheduling all the various work between electricians, plumbers, carpenters and platers. Everything went well in the end and I’m already looking forward to the next project around the property! My specialties in IT Management are Vendor Management and Service Integration (SIAM). My 8 years in consulting client industries have included e.g. manufacturing, telecom, pharmaceutical and food. My assignments revolve around SIAM Model design, Vendor Management model design and training, IT Operating Model design, to mention a few. Highlights in my career are the times when we (there is always a team) have been able to exceed customer expectations or turn around a challenging situation. The most rewarding thing about coaching for me is being able to spark lively discussions among the participants by challenging them to think, and then to both see the group get new ideas and to learn new things myself. I am passionate about the idea of holistic wellbeing, as described in Aki Hintsa’s book The Core – Better Life, Better Performance. Adopting his framework has enabled me to divide my time and effort between the various areas of life and lead a more balanced and fulfilling life. One of the key lessons is adopting the 80/20 rule in most things (diet, exercise etc.) and thus avoiding stressful perfectionism.